Vail Ski Resort is world renowned for providing guests with an experience that truly is “Like nothing on Earth.” The resort is home to seven legendary back bowls spanning seven miles across the backside of the resort. The ski area is enormous with over 5,289 acres to explore and four distinct base areas connected by free buses and heated walkways. The resort has great terrain options, excellent ski schools, and a large assortment of shopping and dining options. The two main base areas are Vail Village and Lionshead. Vail Village located at the base of Gondola One is the original base area and is home to Vail’s iconic covered bridge that crosses Gore Creek. Lionshead Village, located just west of Vail Village is serviced by its own gondola and is home to luxury resorts such as the Arrabelle and Ritz Carlton. Vail is arguably one of the most well-known ski areas in the world and the main reason for that is its sheer size. Boasting 5,289 acres of skiable terrain, seven back bowls and Blue Sky Basin, the mountain offers something for every ability level. The front side of the mountain is ideal for beginner and intermediate skiers looking to cruise perfect corduroy while more advanced skiers can head to the Back Bowls and Blue Sky Basin for a backcountry ski experience inbounds. On a powder day, there is no better place in the world than Vail’s Back Bowls. Chair 5, also known as High Noon Express, which services Sun Up and Sun Down Bowls is a great place to start. Take a pristine run down a classic like Forever or Ricky’s Ridge before working your way east. From the top of Chair 5, take a run in the Sun Up Bowl and head up Chair 17 (Sun Up Lift), which will put you in position to ski into Tea Cup Bowl. From here you have three options: ski down and over to Chair 21(Orient Express Lift) which will give you access to China Bowl and Inner and Outer Mongolia Bowls, ski to Chair 37 (Skyline Express Lift) which takes you to Blue Sky Basin or ski to Chair 36 (Tea Cup Express) for more runs in Tea Cup and China Bowl. A good way to make this decision is to check the lift boards or talk to a patroller. On powder days, there is often a delayed opening for Chairs 21 and 37 to give ski patrol time to do avalanche mitigation. If this is the case, enjoy the powder off of Chair 36 until one of the other lifts open. At this point ski until the snow gets tracked out or your legs give in then start making your way back to the front of the mountain and your après destination. 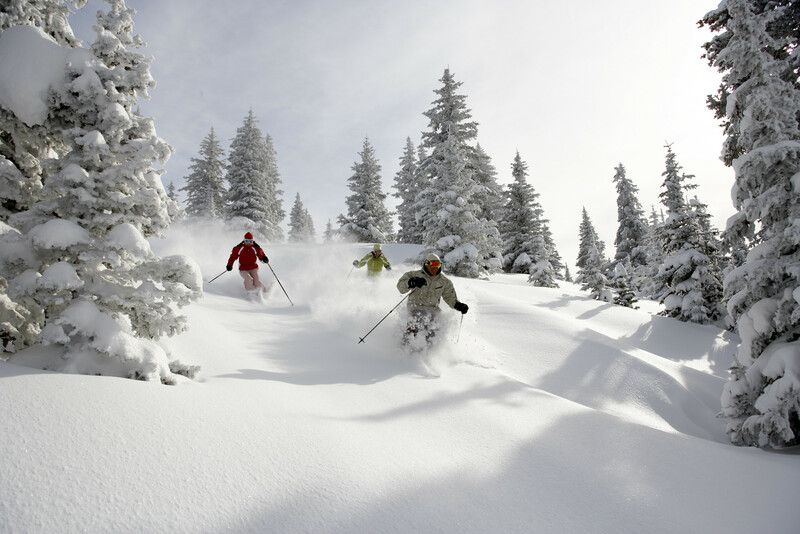 Vail’s world-class grooming is a little slice of heaven for skiers of all ability levels. More advanced skiers will enjoy black diamond cruising on Vail’s longest run, Riva Ridge which gives you four miles of thigh-burning excitement. Northwoods, accessed from Chair 11 (Northwoods Express) is a great option for intermediate skiers as are all the runs off of Chair 2 (Avanti Express). Beginners should head to friendly slopes like Flap Jack and Sourdough off of Chair 14 (Sourdough Express) on the East side of the mountain, Lost Boy in Game Creek Bowl or the myriad of green runs at the top of the Eagle Bahn Gondola. For first timers, Eagle’s Nest is the place to be. Easily accessible from the top of the Eagle Bahn Gondola, a practice area with magic carpets and a non-intimidating beginner lift make this the perfect setting to find your ski or snowboard legs. For the young, and the young at heart, Kids Adventure Zones are scattered across the mountain, teeming with opportunities to discover. Runs like Chaos Canyon, Magic Forest, Sherwood Forest, Porcupine Alley, Coyote’s Escape and Buckskin Glade await young skiers and riders, promising adventure and excitement at every turn. When the ski day is done, Adventure Ridge, located at the top of the gondola is open into the evening—offering even more family activities like tubing, snow bikes, a kids snowmobile track and free guided nature snowshoe tours. While many other ski resorts in the western United States started as mining towns, Vail was built from the ground up to be a ski resort. During World War II the U.S. Army established a training center at Camp Hale located just 14 miles south of what would later become Vail Mountain. The U.S. Army’s 10th Mountain Division trained at Camp Hale and consisted of excellent skiers and mountaineers that fought in the mountains of northern Italy during WWII. Upon their return from the war they quickly became major players in the burgeoning ski industry. A veteran of the 10th Mountain Division, Pete Seibert returned to Colorado after the war to search for a perfect location to build a ski area in the Rocky Mountain region. Pete teamed up with friend Earl Eaton who led Pete on a seven-hour climb up a no-name mountain where they crested the summit to discover the now legendary back bowls. Vail is a great destination for many skiers but the resort can get crowded on the weekends, so check the chair lift status signs at strategic intersections on the mountain to avoid backups. A yellow light means the lift maze is full, so choose an alternative route if possible. A green light means you are good to go. The Westside Café in West Vail is the perfect spot to fuel up before hitting the slopes. Offering eight varieties of eggs benedict as well as traditional favorites, Westside should be your first stop on a powder day. Or any day. 2211 N. Frontage Rd. W.
For a quick cup of coffee or a pastry on your way to the lifts, swing by Yeti’s Grind in Solaris Square in Vail Village. Husband and wife team, Nate and Tara will be waiting with a smile and a latte. Situated at the heart of Vail Mountain, The 10th is Vail’s newest sit down dining experience. A ski-in, ski-out fine dining restaurant overlooking the majestic Gore Range, The 10th’s cuisine is world-class with a focus on Modern Alpine classics. Step out of your boots and into a pair of complimentary slippers to enjoy an upscale lunch, cozy up to the bar with a hot drink for après, or take a nighttime ride on Gondola One to enjoy a gourmet dinner atop Vail Mountain. The name, “The 10th,” is a subtle nod to the veterans of the 10th Mountain Division, many of whom, including several of Vail’s founders, became involved in the ski industry upon returning from World War II and dramatically influenced the development of skiing in the United States. The main dining area features spectacular views of the Gore Range while the south-facing deck captures the afternoon sun and views of the Look Ma and Challenge trails. The restaurant’s design and finishes befit its mountain location, but with a bit more contemporary flair than any of Vail Mountain’s other facilities. The 10th serves lunch daily throughout the winter and apres and dinner service is offered Tuesdays through Saturdays. Reservations are encouraged. If you don’t want to waste time skiing the seven miles to the base from the Back Bowls for lunch, pop into Two Elk Lodge at the top of Chairs 14 and 36. If the famous buffalo chili doesn’t inspire you for the second half of your day, the views will. After skiing powder all morning, nothing hits the spot like Moe’s Alabama-style BBQ in Lionshead Village. Pork, chicken and turkey are smoked daily along with 8-10 southern-inspired sides. The mac n’ cheese is always a favorite along with the banana puddin’ but if you’re lucky enough to go on a day they have sweet potato casserole, it’s a must try. Game Creek Restaurant takes fine dining to new heights. Literally. Located in Vail's scenic Game Creek Bowl, this European chalet is the perfect location for a romantic evening out or a gourmet meal for the whole family. Take a short ride up the Eagle Bahn Gondola to Eagle’s Nest, where you will be whisked away by snowcat through the woods to the restaurant. The magnificent setting is matched with a gourmet, multi-course meal and an award-winning wine list. This is truly a dining experience not to be missed. Located on Vail Mountain. Nobuyuki Matsuhisa, one of the premier chefs of Japanese cuisine, opened his 29th restaurant, Matsuhisa, located in the lobby space of The Solaris Residences in Vail Village in August 2011. Matsuhisa Vail joins dozens of the celebrity chef’s restaurants under the Nobu brand around the world, and only three that carry the Matsuhisa name – Aspen, Beverly Hills and Mykonos, Greece. Matsuhisa has taken traditional Japanese cuisine and infused bold South American and Western flavors to create a style that captivates audiences worldwide. Located in The Solaris Residences in Vail Village, just upstairs from the ice rink. Open for dinner nightly in the heart of Vail Village at The Lodge at Vail and less than a block from Vail Mountain’s new gondola – One, Elway’s features USDA hand cut prime steaks on an award-winning menu chock full of Colorado lamb, fresh fish and creative side dishes. An affordable wine list boasts over 350 selections. The lively bar offers classic cocktails alongside unique appetizers. Dine indoors in the casual mountain setting or après ski in the Colorado mountain sun on the covered or sunny outdoor patios. Parties of 25 to 200 are assured the same great Elway’s food and experience through our professional private dining planners. Uniquely Colorado, that’s Elway’s Vail. Located in The Lodge at Vail, A RockResort, in Vail Village. Established in 1977, Sweet Basil has been a favorite for travelers and locals for more than 35 years. Sweet Basil is a creative, modern American restaurant located in the heart of Vail Village. The menu features imaginative cuisine with an innovative array of diverse influences. The restaurant also is a destination for wine lovers with a wine list featuring more than 500 carefully chosen selections from around the world. Sweet Basil has been voted “Colorado’s Most Popular Restaurant” by the editors of Zagat. Located at 193 E. Gore Creek Drive in Vail Village, across from The Lodge at Vail, A RockResort. Named the “most dynamic restaurant in Vail” by Wine Spectator Magazine, Chef/Owner Thomas Salamunovich’s Larkspur Restaurant brings fine dining to new levels with his contemporary American cuisine. Featuring an open kitchen, giant fireplace and floor-to-ceiling glass wine room, Larkspur is a treat for your senses. Located at the Golden Peak base area, Larkspur features an extensive bar menu and dinner options that change weekly based on the selection and seasonality of ingredients. Located in Vail Village at Solaris Square, this is not your neighborhood bowling alley. Complete with a full service dining room, a sixty-foot bar and ten bowling lanes, Bōl is a one-stop shop for an evening of entertainment. Featuring a modern but relaxed atmosphere and a surprisingly creative menu, Bōl is a perfect spot for a date, large groups and families. A favorite spot for Vail Mountain Ski Patrollers, Vendetta’s has been serving some of the best pizza and Italian food in the Vail Valley for 28 years. For a quieter meal, sit in the main dining room, but for local color and excitement, opt for the pizza bar. Nestled within The Arrabelle at Vail Square and only steps away from the Eagle Bahn gondola, Tavern on the Square is a great spot for delicious food and drink, before and after you hit the slopes. Chef Douglas Dodd has created a new tavern menu with dishes like Ahi Tuna Poke, Peppered Venison Salad and his own twist on traditional favorites like Lamb Shank Pot Pie and Bone-in Veal Schnitzel. The outdoor patio is also a great spot to soak up some sun for après ski. The tavern boasts a large selection of regional brews as well as cocktails like the bacon-infused vodka Bloody Mary. Located in Lionshead in The Arrabelle at Vail Square, A RockResort, near the Alderhof Ice Rink. Situated at the base of the Vista Bahn lift in Vail Village, Los Amigos’ deck is the perfect spot to end your ski day. Views of the black diamond runs like Pepi’s Face and Head First will provide entertainment while margaritas and queso dip will do the rest. One of Vail’s best kept secrets, The Fitz is tucked away in the Manor Vail Lodge adjacent to the Golden Peak base area, making it a popular destination for Vail Ski School instructors and significantly less crowded than the après spots in Vail Village. The atmosphere is casual and the menu features sliders, truffle fries and more. The Red Lion is a Vail hot spot for food, drinks and entertainment. Whether you're in need of some live music or an après ski hangout, Red Lion has you covered. Garfinkel's is a classic ski-town sports bar and grill, offering a comfortable and relaxed atmosphere to grab a drink and catch a game. Locals and tourists alike can enjoy a sunny deck, friendly service and weekly specials. Samana is the place for late night and live music in Vail. Located just past the Covered Bridge in Vail Village, Samana brings world-class musicians and DJs from a variety of musical genres to their intimate setting every night of the week. Shakedown Bar is a great spot for live music and après–ski entertainment. This 190 person capacity live music venue and bar showcases artists from all over Colorado.